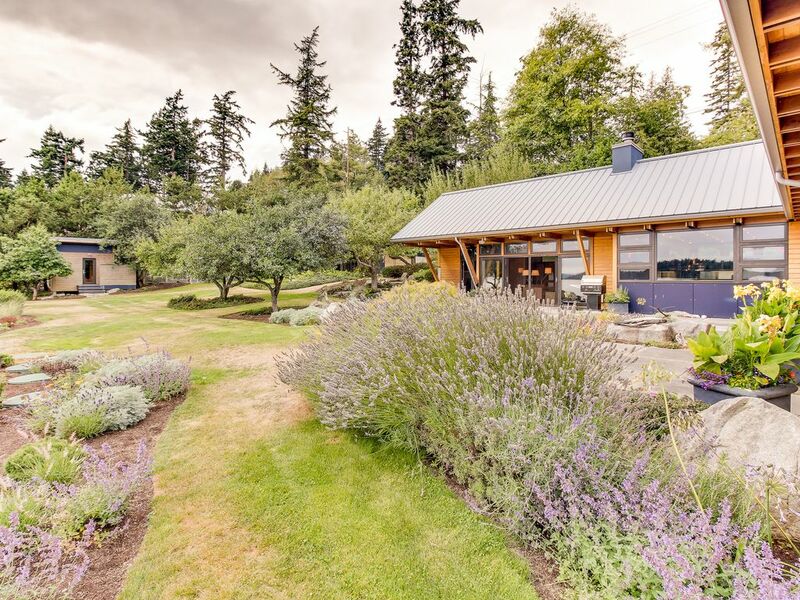 Your friends and family will love this Fidalgo Island home, which combines the waterfront views and tranquility of an isolated natural home with amazing amenities and access to nearby attractions. You even have your own private sauna! This home for seven is less than seven miles away from Anacortes, with shopping, dining, and groceries a short walk away. Afterwards, you can admire the beach just a few steps from your door, or relax elsewhere on your patio. On those days when you really need to relax, the sauna is ready and waiting! The patio lets you take in fresh air in style, but on rainy days, taking in the views from the comfort of a couch or armchair is just as appealing. Warm up by the wood-burning fireplace and take in some entertainment, from music streaming on the WiFi to cable on the flatscreen TV. Between the patio's gas grill and the stainless steel appliances of the spacious kitchen, you have plenty of options when it comes to meal preparation! You can eat at the wooden table for 10, or the nearby breakfast bar for three. Once you're done, cleanup is as easy as loading the dishwasher! Six guests can enjoy this home's three bedrooms and baths, but sofas in the living room and a nearby alcove allow for one more to squeeze in. Whether you're stretching out on the master bedroom's king-size bed or snoozing in the remaining rooms' one king and one queen, you'll be nice and comfortable when it's bedtime. When morning comes, take a shower in any of the spacious baths, pick up your clothes from the washer/dryer, and get ready to explore! There's plenty in the way of natural beauty for you to explore, from fishing at Lake Campbell four miles to the north to oceanfront sights at Deception Pass State Park four and a half miles from your door. But don't neglect the dining and shopping of Anacortes - and especially not its ferry landing. From there, you have access to destinations like the San Juan Islands and the Canadian city of Victoria! Place your reservation today and get ready for an unforgettable journey to northern Washington! Parking Notes: Space to the right of the garage (on the water side) and the parking pad in from the the garage doors is for the main house. There is room for three compact cars - large vehicles, SUVs or trucks will reduce this car count. Guest house parking is on the non-water side of the garage. Please do not block driveway access for guests of the other home. Water Access: This home is beach front. Please respect the adjoining neighbors property and respect Vacasa boundary signs. Boathouse is not for guest use. Please supervise children carefully. Beautiful view, well appointed home, wonderful grounds. FYI - The doors and some of the cupboards could use a little grease but the home and property seem well taken care of. Thanks for sharing your space with us. Thank you for taking the time to leave a review, Laura! We are delighted that you enjoyed your stay at this wonderful view home. We will pass your suggestions onto our management team so that we can make these simple improvements- we can't wait to have you back again! Our family had a fabulous week -- despite the snow, overcast skies, and rain. The warm tile floors kept us cozy and the fully equipped kitchen kept us cooking and baking. The views of the bay, islands, eagles, and robins added to our enjoyment. Special shout out to the helpful caretakers who shoveled the driveway clear of snow. And of course, the sauna was especially nice during this cold February week. Our granddaughter said, "Can we live here?" We'll definitely come again. A beautiful property with stunning views. A wonderful place to find some peace and quiet. We really enjoyed our stay and hope to return. The photos don't do the big and serene water view justice, but the home and setting are just as they look in the photos. My family rented both this main house and the guest house, but we would not shy away from only renting one. Renting both for our extended family of 9 people (total) was ideal, but pricey. We enjoyed the views from the inside and out, the beautiful landscaping, the indoor fireplace, the outdoor fire bowl, the kitchen, the beach, the sauna, the beautiful architectural detail of the house. There is some significant wear and tear from the weather in the master bedroom that needs attention from the owners, but otherwise, things are well kept. It was a long weekend to remember. Go for it! You won't regret it. Awe inspiring view and accommodations! We are coming back! We came to spend Thanksgiving with our son who is stationed at Naval Air Station Whidbey. The home is spacious, kitchen well equipped except for the ice maker which doesn’t work and you need to fill the 3 ice trays for ice. The parking is limited and a very steep driveway but the water view is astounding and the home is situated on a spacious lot. The second smaller rental had 3 sets of guests during the week we were there. A bit uncomfortable was the walkway to the smaller rental behind the main home with windows that the other guests can look down into our kitchen/dining area. We did the sauna once because we didn’t want to share with the other guests although it is large enough to accommodate 6-8 people. Plenty to do in Anacortes! Don’t miss a visit to “The Store” at the top of Commercial Blvd behind the roundabout as you enter Anacortes. Great place for delicious variety of homemade muffins and cookies plus a nice selection of wine. An afternoon shopping in La Conner, a day trip on the WSF to Friday Harbor, and simply enjoying some board games back at the VRBO by the fireplace made for a very memorable holiday visit. Beautiful views. The little tv room is kind of odd, but it worked. A very nice home. We were quite comfortable. The ice maker in the frig wasn’t working but there were trays to make ice. Inconvenient but didn’t take away from our stay. Beautiful view. We apologize for the icemaker not working. We strive to have all appliances in working order when a guest arrives. Thank you!